(Nanowerk Spotlight) Imagine intelligent medical implants that can continuously monitor their condition inside the body and autonomously respond to changes such as infection by releasing anti-inflammatory agents. Thanks to nanotechnology, medical research is moving quickly towards this goal. The market for medical implant devices is huge and growing fast – in the U.S. alone it is estimated to be $23 billion per year and it is expected to grow by about 10% annually for the next few years. Implantable cardioverter defibrillators, cardiac resynchronization therapy devices, pacemakers, tissue and spinal orthopedic implants, hip replacements, phakic intraocular lenses and cosmetic implants will be among the top sellers. Each year in the U.S., almost 500,000 patients receive hip and knee replacements, about the same number need bone reconstruction due to injuries or congenital defects and 16 million Americans loose teeth and may require dental implants. Implant wear and infections remain the major problem facing the long-term success and survival of these artificial joints. Studies have shown that large amounts of minute wear particles are produced by orthopaedic implants (both metal and plastic), setting into motion a cascade of events that ultimately may result in the disappearance of bone around the implant (osteolysis). This can lead to implant loosening and failure of the artificial joint. Diagnosis if and what is wrong with an implant relies on X-rays or other imaging techniques. The techniques are insensitive, not in real time, and require the patient to go into a hospital. Surgery to replace these failures is more difficult to perform, is more costly, and has a poorer outcome than the original joint replacement surgery. A new study shows that the use of polypyrrole films as electrically controlled drug release devices on implant surfaces can potentially improve bone implants. By electrodepositing antibiotics or anti-inflammatory drugs in a polymer coating on medical devices, researchers at Brown University demonstrate that such drugs can be released from polypyrrole on demand – by applying a voltage – and control cellular behavior important for orthopedic applications, i.e. inhibit inflammation and kill bacteria. "Polypyrrole is an intrinsically conductive polymer which can be electrochemically synthesized as a thin film on conductive materials," Thomas J. Webster tells Nanowerk. 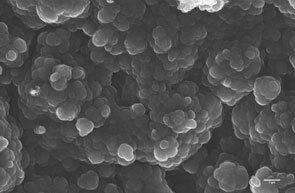 "Polypyrrole has been studied for various applications such as corrosion protection, electrochemical biosensors, electrode coatings, bioelectronics, solid-state devices and patterned circuits, and, although it has emerged as a promising material with substantial potential for biomedical applications and controlled drug delivery, few studies have investigated its possible role in decreasing infection and inflammation for orthopedic applications." Reporting their findings in the January 17, 2011 online issue of Nanotechnology ("Electrically controlled drug release from nanostructured polypyrrole coated on titanium"), Webster and his team demonstrate a 'proof of concept' to develop and evaluate on-demand delivery of penicillin/streptomycin (antibiotics used to treat grampositive and gram-negative bacteria) and dexamethasone (a glucocorticoid used clinically as an anti-inflammatory and immunosuppressive agent) in situ from polypyrrole. It shows that medications can be deployed on demand from the surface of bone implants to reduce the prevalence of both septic and aseptic complications. 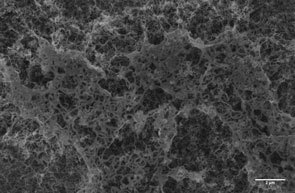 This work is an extension of previous studies from Webster's nanomedicine lab demonstrating that these nanostructured materials sense and promote new bone growth ("Greater osteoblast functions on multiwalled carbon nanotubes grown from anodized nanotubular titanium for orthopedic applications" and "Multiwalled carbon nanotubes enhance electrochemical properties of titanium to determine in situ bone formation"). To create their polymer coating, the researchers first grew multi-walled carbon nanotubes (approx. 55nm in diameter) out of anodized nanotubular titanium using cobalt-catalyzed chemical vapor deposition. Polypyrrole monomers were either oxidized with the antibiotics or the dexamethasone before electrochemical polymerization of the polypyrrole around these nanotubes was carried out. "Anionic drugs, bound electrostatically inside the polypyrrole thin film, were released in our present study by the application of a negative voltage," explains Webster. "For the first five cycles, we observed the anionic molecules to move in and out of the polypyrrole thin film due to continuous oxidation and reduction. The reduction peaks of penicillin/streptomycin release disappeared after 15 cyclic voltammetry cycles. For dexamethasone, the reduction peak was still observed after 25 cycles, but disappeared after 40 cycles." The increase in the amount of drugs released after the electrical excitation was significant until 5 cycles. The cumulative release of penicillin/streptomycin and dexamethasone approached 80% of the drug and no further drug release was observed with further cycles. Webster notes that, although they found that polypyrrole can be overoxidized and lose its electroactivity at higher potentials or when voltages are applied for longer periods, carbon nanotubes can maintain and prolong the electroactivity of polypyrrole due to their excellent conductivity properties. He points out that polypyrrole can be doped not only with antibiotics and drugs like dexamethasone – allowing the preloading of drugs to obtain clinically controllable and predictable doses – but also various other biomolecules such as for instance growth factors, peptides, enzymes, antibodies, proteins, etc. to alter its biological, physical, chemical and electrical properties to design a controlled released system for numerous biomedical applications. In addition, polypyrrole can be coated on electrodes or integrated with implantable chips to introduce an electrical signal into the biological environment. "These preliminary results lay the foundation for developing intelligent orthopedic drug delivery technologies that can utilize a closed-loop sensing process with drug administration based on that sensing information," says Webster. "Both carbon nanotube-based sensors and controllable drug delivery systems could be an excellent way to improve the lifetime of orthopedic implants, allowing implants to kill bacteria, reduce the susceptibility of implants to prolonged inflammatory responses and ultimately increase bone formation."